An official welcome to new member Rachel Davis. Rachel joins us from Eaton in Van Wert where she is an HR Manager and was officially installed as a club member during the November 2nd meeting, though she has been a member since October. Pictured left to right is Ray Able – Lt. 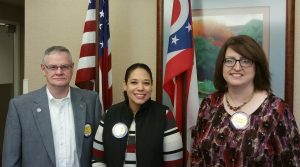 Governor Ohio District and Secretary Treasurer for Optimist Club of Van Wert, Rachel Davis from Eaton in Van Wert and Optimist Club President Diana Cearns with First Federal of Van Wert, OH. Way to be #OptimistStrong!